Home to Pratt, Parsons, and a number of other top design schools, New York City has a storied history of interior design. Elsie de Wolf worked with Gotham’s elites, designing for the Vanderbilts, the Morgans, and the Duke and Duchess of Windsor in the early aughts of the 20th century. The city has always drawn innovators from all over the world to design projects with the biggest budgets. The designers on this list are the top firms continuing New York City’s tradition of setting interior trends for the world to follow. The bicoastal offices of Ike Kligerman Barkley offer architecture and interior design services via both traditional and innovative processes, expressing design concepts with hand sketches and an in-house 3D printer. Co-founder John Ike is a 30-year veteran of the New York City interior design scene and spent time working with revered residential architect Robert A.M. Stern. Thomas A. Kligerman grew up in Connecticut and abroad, which led him to acquire an interest in French and English architecture. Joel Barkley, architect and the third co-founder of the firm, is a Princeton University Architecture graduate and spent time with S.O.M. and Diller + Scofidio. In the firm’s 25 year history, it has styled lofts, mountain lodges, and even a Manhattan apartment in a repurposed butter factory. An AD100 listee since 1995, Ike Kligerman Barkley has won ICAA Julia Morgan and Stanford White Awards, the DDB Stars of Design Award, and the AIA New York Chapter Award. Actress Meg Ryan enlisted Ike Kligerman Barkley to reimagine her full-floor, SoHo loft. The 4,100-square-foot pad, previously owned by Hank Azaria and artist Cindy Sherman, combines classical architecture with moody colors and textures. The 40-foot entry hall and immense windows facing Mercer Street make for a grand entrance. Black flooring runs throughout, past the black French doors that lead into the dark, glossy parlor and formal dining room. The latter features a dramatic marble-clad fireplace. The rest of the home is bathed in light-reflecting neutrals and dark accents. In the kitchen, black, oversized pendant lights float over the country, wood kitchen table. The large mirror over the Carrara marble counter and backsplash doubles the visual space of an already expansive kitchen. Following the renovation, Ryan sold the unit for close to $10M. In a Park Avenue remodel, Ike Kligerman Barkley used turquoise Venetian plaster and mid-century furniture to bring charm to a contemporary, open floor plan. Sliding resin doors close to define each space, while letting light diffuse through the home. Living room seating is courtesy of famed mid-century designers Vladimir Kagan and Karl Springer. The eye-catching walls get a touch of modern opulence with narrow, brass inlay. Studio Giancarlo Valle designs interiors with architectural eloquence. Valle had a global upbringing, spending time in San Francisco, Caracas, and Guatemala City. The Princeton University graduate earned a master’s degree in Architecture and the Suzanne Kolarik Thesis Prize. After working with New York City-based SHoP architects, Valle established his own firm. His cosmopolitan sensibilities touch all of the firm’s work in interiors, objects, fashion, and art. The New York Times, Vogue, Elle Decor, and W Magazine have all lauded the firm for their work. Marina Larroude, Fashion Director of Barneys New York, knows style. She trusted Studio Giancarlo Valle to join her New York aesthetic and Brazilian roots in her Upper East Side townhouse. A luxurious marble coffee table by Italian designer and architect Mario Bellini and velvet armchairs by Jindrich Halabala look impossibly approachable set on a natural fiber, sisal rug, across from the all-black fireplace. There’s comfort in the curves of the extra-wide, plush bench, the Reuleaux-shaped shagreen side table, and the deceptively simple walnut dining table with its wide legs and Brazilian dining chairs. The firm also styled a Cold Spring retreat for artist Marilyn Minter. Valle came to the project having previously worked with its original architect, Stan Allen. The Upstate New York home, which adjoins a studio for the widely exhibited painter, features an enviable art collection with pieces by Kara Walker and Joyce Pensato displayed in varied milieus. The design employs clean lines in whimsical ways. A jumble of backlit, cubic, oak volumes hides a coat closet. A wall of staggered display boxes are dotted with the odd, colored panel. The firm also designed some of the furniture pieces, including a tufted banquette that sits at the top of the two-story space that joins the residence with the studio. W Magazine covered the renovations and interiors. In 2008, Ariel Ashe and Reinaldo Leandro partnered to establish the architecture and interior design firm that bears their names. Their respective backgrounds in set design and architecture amount to a flavorful take on modern design, unafraid to challenge a paradigm. The partners met while working at Pierce Allen, the design firm that served as a model for their own. Their signature style is unpretentious luxury. From residential to commercial, and furniture to product design, Ashe + Leandro are applying their skills to projects in New York and London. Within a few years the duo moved from the Architectural Digest list of designers to watch to the AD100 list. Naomi Watts & Liev Schreiber tapped Ashe + Leandro to design a Manhattan apartment for their family of four. In just over a year, the firm took the actors’ two units from drawings to a fully renovated duplex. Overall, the design balances weighty furniture, like a broad, wood dining table, with more delicate elements, joining pieces evocative of a luxury loft with the warmth of a family townhouse. The master bath is an oasis with a Victoria + Albert soaking tub beneath a modern, Ralph Lauren Home light fixture and a soft, white archway. Penny-Tile floors and gold-framed antique mirror add a touch of old New York. The firm applied the same attention to detail for a family home on Charles Street in the West Village. In the master bedroom, a custom velvet bed in teal is a textural relief against a dark blue wall. Fine brass sconces and clean, cubic nightstands make the room decidedly contemporary. The guest bedroom features an M.C. Escher-style, geometric print wallpaper by Deborah Bowness. In the living room, antique mirrors and a Damien Hirst painting sing in harmony. Jesse Carrier and Mara Miller, the husband-and-wife design team behind Carrier & Company Interiors, have an A-list clientele. Photographer Annie Leibovitz and fashion designer Jason Wu are among the tastemakers who have entrusted Carrier & Company Interiors with designing their living spaces. Vogue editor Anna Wintour is a client and even penned the foreword of the firm’s tome Carrier & Company: Positively Chic Interiors. A fixture on the Architectural Digest AD100 list and Elle Decor A-list, the firm has designed New York City penthouses and lofts and Hamptons retreats since incorporating since 2005. Carrier and Company Interiors designed a dream apartment for actress Jessica Chastain. For the project, profiled by Architectural Digest, the firm revived the Victorian-era beauty of the landmarked building, refinishing its six fireplaces, including one in the master bedroom that was unearthed during the renovation, a chandelier that original to the apartment was removed from a laundry room, restored and used in the front parlor (not the photo shown); the chandelier in the Living Room is from Ralph Lauren Home. The client’s 1954 jukebox, as well as a chair from Lauren Bacall’s apartment at the Dakota lends a retro, glamorous air for a Hollywood powerhouse. Domino magazine chronicled another Carrier & Company project, the renovation of a TriBeCa loft for a young couple hoping to build a stylish, kid-proof home. The firm incorporated the family’s pieces in surprising ways, like upholstering a living room ottoman with a kilim rug the couple acquired on a trip. An extensive collection of antiques was whittled down to the most impactful pieces. A Louis XVI chair, with its original upholstery and 18th-century, gilded barometers adds traditional flair without clashing with the loft’s contemporary lines. Harlem-based Sheila Bridges is known for her effervescent presence and style. A graduate of Brown University and Parsons School of Design, Bridges also studied decorative arts at Polimoda in Italy. Time magazine and CNN have both dubbed her the country’s best interior designer, and she hosted her own show on the subject for four seasons on the Fine Living Network. Since establishing her own firm in 1994, Bridges has nabbed many of her clients after they have seen her own home. Also a commercial and institutional interior designer, Bridges designed an 8,300-square-foot, Harlem office space for President Bill Clinton, as well as projects for Columbia University. The designer penned Furnishing Forward: A Practical Guide to Furnishing for a Lifetime and is a regular contributor for NBC’s Today Show. The permanent wallpaper collection at Cooper-Hewitt National Design Museum includes Bridges’ Harlem Toile De Jouy design. A young couple retained Sheila Bridges for the redesign of their historic brownstone. The homeowners recently moved from Chelsea and knew the local queen of design would bring life to their 5,000-square-foot Harlem home. The designer overcame the shortage of daylight so common to closely abutted brownstones by using a light, airy palette. Linen wall coverings and Stark sisal rugs add natural softness. Furniture was chosen for luxurious upholstery, comfort, and delicate legs that lift rooms rather than weighing them down. Some of the original features stayed; mahogany pocket doors and a Venetian glass chandelier were renewed and left in place. A Downtown penthouse allowed Bridges to flex her facility with contemporary design. In the kitchen, medium-tone, wood, flat-panel cabinetry is sleek, but not cold. Look quickly and you may miss that the chandelier twinkling above the island is made of flatware. The indulgent wet bar makes use of the same cabinetry, set off by classic, white subway tile. Known for her daring use of wallpaper, Bridges dressed a powder room in charcoal pinstripe overlaid with a simplified, chartreuse damask print. Jamie Drake and Caleb Anderson, co-founders of the eponymous New York firm, are responsible for interiors in some of the city’s most luxurious towers. One57, 56 Leonard, and the Baccarat Residences all bear the same sophisticated and refined style that Drake/Anderson has brought to Hamptons estates and Paris townhouses. Each partner established a reputation individually — Drake as the forerunner of modern interiors, and Anderson for his dexterity with period styling — before joining forces. Together, the partners have landed on the Elle Decor A-List and the Architectural Digest AD100 list and earned a spot in the Interior Design Hall of Fame. Drake/Anderson took on the redesign of a three-bedroom apartment in a 1940s Art Moderne building in Greenwich Village. The corner apartment had uncommon space and light for the area. Herringbone oak floors and large, steel windows sealed the deal for the homeowner. Still, the L-shaped unit needed help to become a modern sanctum. The team replaced its client’s old furniture with an eclectic mix of high and low pieces. Working with a contemporary, white-and-gray backdrop, the designers added pops of color with abstract art pieces and the client’s personal collection of books and family mementos. Sparing but confident, the project led Drake/Anderson to distill design theory to its most elemental form. The firm also took on what may be the most quintessential interior design project in New York: renovating Gracie Mansion. Former Mayor Michael Bloomberg commissioned Drake/Anderson to revive the official home of city mayors since 1942. The firm revived the landmark inside and out. Drake personally mixed the buttery yellow for the house’s exterior, referencing piles of research. Inside, the pair swathed the library in a historically accurate, vibrant turquoise. The State Bedroom walls got sprigged wallpaper in a color palette consistent with the existing late-19th-century, faux bamboo furniture. The 50’ x 24’ ballroom was finished in a restrained and dignified blue. Thumb through top-designer lists and you’ll come across John Barman, Inc. more than once. Architectural Digest, New York Magazine, and New York Spaces have all placed the firm among the city’s — and the world’s — most distinguished designers. A New York City native and a graduate of the Wharton School at the University of Pennsylvania, Barman has brought the colorful style he developed over a 20-plus-year career to the homes of jazz legend Wynton Marsalis, Good Morning America host George Stephanopoulos, and New York real estate magnate Larry Silverstein. Firm Creative Design Director and former fashion designer Kelly Graham have fielded commissions that grace the pages of the US, Germany, and France editions of Architectural Digest, The New York Times, Veranda, and Interior Design. John Barman gave a Downtown penthouse the type of colorful rebirth for which his firm is known. Sumptuous, flocked-velvet wallpaper in teal covers the walls of the living room and dining room, topped with matching crown molding. Each room is hung with vibrant artwork that cedes attention to custom-designed, graphic rugs. In a slight mood shift, the den bears green flocked-velvet wallpaper with a touch of gold leaf, and herringbone, wood floors. Every space is defined by a unique play between color, contrast, and unexpected lines. New, arched doorways between rooms add character and consistency. John Barman, Inc. utilized a much more restrained palette when designing a writing retreat for Pulitzer Prize winner Neil Simon and his wife Elaine Joyce Simon. The couple scooped a penthouse in their building to serve as a nearby pied-à-terre for work and casual entertaining. The original, 1920s layout was dark and dated, so Barman used shades of white to enhance and reflect sunlight. The couple’s art collection — including a Modigliani — brings color to the walls and a range of jewel tones brought forward in accent pieces throughout the five-room apartment. The result is a contemporary interior that makes a comfortable space for writing and informal entertaining. In place of the existing warped floors, Barman laid white-stained planks. Partners Anthony Ingrao and Randy Kemper lead a team of 36 designers and architects known as Ingrao, Inc. The firm has been based in New York City since its inception in 1982 and has designed interiors from St. Tropez to Tel Aviv. Elle Décor, Vogue and The New York Times have featured some of the company’s most notable projects. The AD100 tastemaker designed a sprawling Upper East Side apartment for the CEO of Simon Property Group that later hit the market for $39.5M. Ingrao has also delivered high-end renovations for business executive Jack Welch and music producer Clive Davis. Anthony Ingrao is a recipient of a Drew University award for Alumni Achievement Award. Ingrao, Inc. designed an indulgent and sultry apartment for actress Kim Cattrall. The firm’s global style came to bear in the Park Avenue digs, which features a marble mantle from London and light fixtures Ingrao and Cattrall salvaged from Parisian resellers. Two velvet club chairs and an oversized, gilded mirror bring an Old Hollywood element rivaled only by the mirror-inlay and dining room table. Though grand, the home still feels personal and enveloping. The “monkey room,” a sitting area off of the master bath, is decorated with old-world prints of wildlife in a gesture to Cattrall’s Chinese Zodiac sign. Ingrao, Inc. also created a design for Donny Deutsch’s Upper East Side townhouse that sits at the other end of the style spectrum. The six-story abode of the Deutsch, Inc. chairman and former CNBC host is thoroughly modern. After demolishing everything but the original facade, the homeowner and architect Frederic Schwartz built the townhouse anew, and Ingrao dressed the 15k-square-foot space with art by Barbara Kruger and Andy Warhol. Quirky pieces like a sculptural console table and a wall-sized, upholstered headboard bring character the broad, white plains of the main living spaces. Steven Gambrel was only three years out of an architecture program at the University of Virginia when he established his eponymous interior design firm. The company’s office, a renovated cabaret in the West Village, speaks to Gambrel’s fluency in the transcendent features of New York architecture. With a keen sense of proportion and the relationship of objects to their space, Gambrel has expanded his purview from international residential projects to lines of custom accessories and lighting fixtures, as well as an online custom furniture resource called “Dering Hall.” New York Magazine, The New York Times, and Elle Décor have featured S.R. Gambrel interiors. Architectural Digest has ranked Gambrel among their AD100 list of the best interior designers and architects in the world. When the historic plaza hotel was gutted and renovated, developers retained S.R. Gambrel to design the interiors of the Astor Suite. The 4,284-square-foot abode boasts a venerable list of tenants, including the Duke and Duchess of Windsor, John Jacob Astor, and President John F. Kennedy. S.R. Gambrel took that history into account in their multi-million-dollar redesign of the three-bedroom, five-and-a-half-bathroom spread. The firm engaged the artisans who rebuilt Windsor Castle to install period features like English oak paneling and millwork, a plaster ceiling, and imported, hand-hammered leather walls. 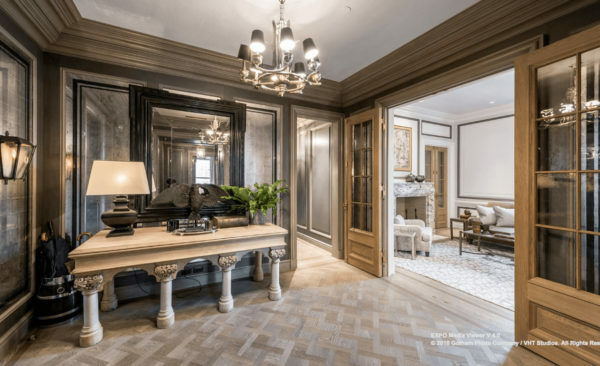 The first owner following the renovation listed the property for rent at $125K per month, but the palatial, 5th-floor apartment overlooking Central Park is now for sale with a $34.5M price tag. Moving from traditional to trending, S.R. Gambrel renovated a duplex in the Meatpacking District, bringing opulence to a neighborhood that was once known for housing the city’s slaughterhouses and is now a nightlife destination. Walnut millwork — cerused to add contrast and depth — ebonized doors, and Venetian plaster complements luxurious wall treatments that vary by room. Textures range from translucent, bronzed mercury glass to silver leaf and parchment. Every space is dressed in discerning decadence. Over the last 35 years, Vicente Wolf Associates has become a name in celebrity interiors, luxury storefronts, and even fashion and jewelry. The studio heads behind New Line Cinema and Showtime have all engaged Vicente Wolf Associates for residential designs. Guests of the Ayya Hotel and Wynn Executive Suites in New York can get a taste of Vicente Wolf Associates interiors. The firm has published five books chronicling their work. For his exceptional work, Wolf has earned an honorary doctorate from Boston Architectural College and the Pantone Color Award. Wolf is also an Interior Design, Design Hall of Fame inductee. Julianna Margulies worked with Vicente Wolf Associates to redesign her 2,200-square-foot, SoHo loft. The actress knew the firm through the pages of her favorite design magazines. The combined studio and two-bedroom benefited from 10-foot ceilings and generously sized windows, but the open layout lacked definition. Wolf rounded one corner of the space and added a banquette and dining table to create a designated space for meals and entertaining. In the living room, a rounded sofa, lounge chair, and coffee table create visual delineation with their similar shapes. The palette enhances the abode’s perceived weightlessness; neutral upholstery; gray, bleached maple floors; and white woodwork bring light and air to the space. Thirty blocks up in The Grand Madison, just north of Madison Square Park, Vicente Wolf Associates helped music industry executive Doug Davis, son of Clive Davis, make a three-bedroom loft his own. The renovation ensured that Davis could get away from it all in his own home. The bedrooms and master suite are tucked away in their own wing, and the fully-outfitted media room is lined with insulating cork. At the opposite end of the unit, the homeowner can entertain in a great room with custom wood floors and a fabulous view of the park and city beyond. Following the redesign, Davis put his apartment on the market for $6.3M. Learn the about the best architects in New York City. See rankings of the top architects and examples of their work they are designing.